The sabre (sometimes called the broadsword,) is a short weapon but it can be used like a long weapon. In practice hands, eyes, body form and footwork must be well co-ordinated. The force is continuous and unbroken. 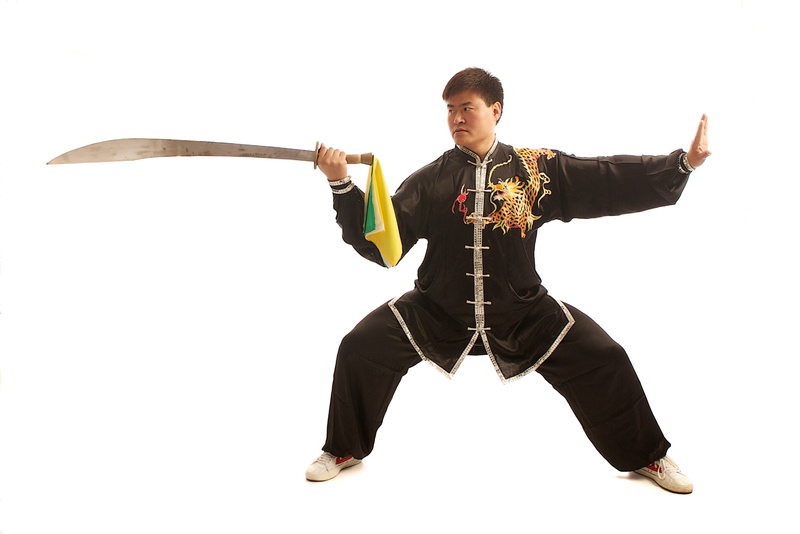 In practising the sabre, you must use “chan guo-nao” twining/wrapping head, widely cutting and hacking with great momentum. It is said in the boxing proverbs; when racticing single sabre, watch one’s hands, when practicing double sabre, watch one’s footwork. The left hand must follow the change in techniques of the sabre. There are thirteen sabre techniques: They are rolling, closing, pricking, blocking, cutting, hacking, scooping, cross-cutting, twisting, shaking, supporting, slicing and tilting. 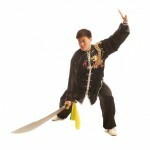 They reflect the characteristics of Chen style taiji single sabre. They combine hardness and softness in harmony, equally stressing quickness and slowness, dodging and weight transfers, relaxing and nimble, springing and shaking, switching between each without separation, coiling to neutralise force. The form retains the aura of a fierce tiger.